I signed up for the Boston Marathon without every having run more than a 5K. As one may imagine, I learned quite a bit along the way through experience and trial and error. Because so many of you have reached out to me asking how YOU can work up to achieving your running goals whether that’s a 5K, a half marathon, or a full marathon, I wanted to compile the most frequently asked questions I get about running. Be mindful that though I have some mild anatomy training from yoga teacher training, I am not a physical therapist or a personal trainer. Though I have done hours of self-studied nutrition for my own body, I am not a dietitian or a nutritionist. Though ACE certification and a Masters of Nutrition are on my bucket list for the future, everything I share here is information that serves my body versus information that can be clinically applied to the public. With the understanding that each of our bodies are unique and individualized, I hope my experiences kickstart you on your own personal running and body awareness journey. On Monday April 17, 2017, I boarded my flight from Boston, MA to Austin, TX. I was traveling back to my apartment in the land of tacos and cowboy boots after spending Easter Weekend with my family. While in the air, I looked down at my city and felt my heart fill with joy and admiration as I saw the crowds gather to watch the 121st annual Boston Marathon. It was in that moment — miles above ground — that I had the first thought “I am going to run the Boston Marathon”. The feeling did not make sense as I was not in a running routine at the time. I had never run more than 3 consecutive miles. And frankly, I thought that I hated running. But there was something so overwhelmingly moving about that moment. I felt that connection to my city, to the significance of the Boston Marathon, and to the power my physical body could work up to. You start with the recognition that a running journey may be something you want and you trust yourself wholeheartedly that despite fear and despite limiting beliefs that you CAN do this. “Who will I be when I have achieved this?. Whether that note is in your phone or on a physical piece of paper, put it in a place that you can refer to later. Especially if you are training up for longer distance races, there will be moments along your journey where you are questioning WHY you are doing this. You’ll experience physical pain, mental exhaustion, a lack of time because you are human. Your “why” will call you back. Your “why” will give you purpose and discipline. Never lose sight of it. Don’t you have to qualify for Boston? There are two ways in which you can run the Boston Marathon. The more well-known way is to be a runner, run at least one marathon and qualify based on your time and age group. This was not going to happen for me as a first-time marathoner, so I signed up and was picked for a charity bib through the House of Possibilities. HOPe is an organization in the Boston area making a difference for children, adults, and families, living with developmental challenges by providing high quality programs and much needed relief. There are many charities in the Boston area that will sponsor running. Each have varying fundraising minimums you must hit in order to run. I was required to raise a minimum of $6,000. I thought this would be impossible. The good of humanity proved me wrong. What running/training plan did you follow? I can’t begin to describe how much googling, reading of Runner’s World articles, and how many text messages I sent to folks I knew who had run marathons so I could begin to develop a plan as soon as I mentally committed to the idea of running. I had many months to train and I wasn’t committed to the Boston Marathon yet because it was too early to sign up for charity bibs; so in the meantime, I started to train with Erin Bailey. In June 2017, I started her 12 week online training program. Her program, though not designed specifically for running or marathon training, focused on building full-body base strength and endurance. Her workouts included strength training, plyometrics, cardio challenges, and HIIT workouts. She knew of my intention of running in half marathons, and eventually running Boston so she shared her experiences of running Boston with me. She no longer trains individuals online, but she is now the Director of Content and Community for Asics Studio. Between her videos on her Instagram and the app’s workout content, you will find some awesome moves in there to add to your workout routine. Slowly, I started to incorporate more running into my routine in preparation for my first half as I was starting to finish up Erin Bailey’s plan. I attempted to follow along with the Boston Marathon Level One training plan that they have on their website. This plan allowed for 20 weeks (5 months) of training up to the hills and distance of the annual Boston Marathon. My legs quickly got burnt out following this because I wasn’t used to running frequently, especially not 4 days a week. And it was completely unsustainable with how much weight training I was doing — lots of squats and deadlifts. So my legs were hurting with running multiple times a week on top of that. It is important for you to know that my goal for the Boston Marathon was not to run under a certain time. If you are looking for information about how to improve your time, this may not be the article for you. My goal was to finish and run that distance for the first time so I adjusted my plan to something that worked better for my body and my goals of getting to 26.2. Below is my exact schedule I followed for my first half marathon. I decided that with cross training (it was important to me to keep this a part of my training), I could easily commit to 2 days a week running. This meant 2 days running, 3 days weight training/plyometrics/HIIT, 1 day yoga and 1 day of rest. I also committed to doing my long runs every 2 weeks, slowly increasing in length over time. *This meant that some time in this week I would do my 2 runs. One run would be 1 mile long. The other run would be 3 miles. *Some time in between August 7-11th, I would do a 2 mile run and then on August 12th, I was committing to running my long run. Long runs were easiest for me to do on Saturday mornings due to my schedule. My long runs were every other Saturday. I very purposely scheduled my long runs to be every two weeks on a suggestion of another runner. The argument being that 7 days goes by so fast when you work full time and are a human dealing with life. As a newer long distance runner and when you climb in mileage, your legs are going to want at least if not more than 7 days to recover. Remember you’re doing something new to your body. Be gentle when you can. I know people who have jumped into 13.1 without giving themselves as much time and have done it fine. But for my body, I feared training up too fast. I feared injury. I feared having a 13.1 that felt like hell instead of something that felt enjoyable or a distance I felt I could handle. I had the time to train so why not give my body time to work up? I was asked how much time is needed to train up for a half marathon. I don’t know if I’m fully able to answer that because 1) I’m not trained in physical movement and 2) what I do know is that it is so dependent on where you are starting from. I liked this article and it’s explanation of how much time is needed. After my first half marathon, I kept with the schedule of long runs every other Saturday. The only difference was that my long runs started to get longer as I prepped up for 26.2 miles. At this point, I had 5 more months to go from 13.1 miles to 26.2. I planned my last long run 2 weeks out from the marathon and worked backwards with the time I had left with my two-week-long-run rule and I planned at least one more 13.1 race as a part of that. If I were to do this over again, I’d schedule my last long run 3-4 weeks out from my target race day to ensure my legs truly recovered and were ready to go into battle for 26.2. I was told my multiple runners afterwards that 2 weeks felt too close. I’d agree. What was the longest you ran before your half-marathon? Full marathon? My longest run before my first half marathon was 10 miles. The crowd of runners and spectators will carry you through the extra 3.1 miles. You can run more than 10 if you wanted. I personally felt ready having run 10. My longest run before my full marathon was supposed to be 20 miles. That was what I had scheduled 2 weeks prior to 26.2. At mile 9 of that 20 miler, I started to experience a foot cramp and at mile 10, I couldn’t put any more weight on my foot (injury #2). Needless to say, I didn’t finish the rest of the run. So…. the longest I ran prior to the marathon was a completed 18 miler. My orthopedic doctor (that I was seeing for injury #1) strongly recommended to me that if I could not hit 18-20 miles in my training before the marathon, I should rethink the marathon completely. That is because you risk injury jumping in milage because the muscles and the joints didn’t train up in distance. Granted, I know people who have only run 14 miles and then ran a marathon, but it was brutal for them. Having been able to hit 18 miles, I felt somewhat decent about going for 26.2. And if I were ever to train for a marathon again, I would try to shoot for 20 miles 3-4 weeks out of my race. What did you do for cross-training? As I mentioned I was doing a lot of weight training/HIIT/plyometrics work — focusing on the entire body: arms, legs, core. As you climb in mileage, your legs — particularly the muscles of the hips — get tired. You want to make sure they are strong enough to hold you in the later miles so you don’t slip into misalignment. I have more on exactly what I focused on strengthening in my injury section. Until then, this is a great article that suggests some exercises for strengthening the necessary muscles of the leg for running. From January of 2018 to April 1st, I was in the middle of yoga teacher training while also ramping up to looong miles for my marathon training — I don’t necessarily recommend that — but I was doing an excessive amount of yoga in addition to training (as a part of training). I’m slightly biased because I am a yoga teacher; however, all forms of yoga can be included into your training and all are beneficial for different reasons. Power yoga or heated vinyasa build strength and increase flexibility. I started to get into yin yoga as a form of recovery. A passive practice, yin yoga involves variations of seated and supine poses typically held for 3 to 8 minutes, accessing deeper layers of fascia — the connective tissue around the joints and muscles. Anyone in the Austin area, I highly recommend Jerry’s bittersweet classes at Wanderlust. Tell him you are running a half marathon or a marathon. First, he’ll ask you who dared you and ask you why you’ve decided to put your body through hell AND THEN he’ll help you stretch and strengthen the areas of the body you need to for running. He’s incredibly knowledgable about the human body and one of his Friday night classes that focused on hip opening was one of my favorite moments in my marathon journey. Camila is a fantastic teacher for yin (also at Wanderlust). I tried pilates for the first time recently — well after my marathon training ended — and I wished I had tried it sooner. Maybe it was the class that I went to or the instructor I saw that made me feel this way; but the day after class, I felt a part of my lower core that I’ve never been able to access with core exercises. The pilates machine, apparently known as a reformer, does a good job at strengthening the muscles needed for hip abduction and adduction as well. Though I’ll never know, I feel as if I would not have been injured (or injured as severely) if I made this a regular part of my practice. How to balance other workouts while also training? While also working? This is tough. It really really is tough. Remember that “why” letter I mentioned at the beginning of this post? Pull it out and read it often. It will help you with this idea of achieving “balance”. I worked full time and that was not something that I could reschedule so my workouts were scheduled around my 9-5. My personal body functioned better throughout the day if I got my workout in before work. Logistically, this worked better for me too. I worked a job/was working on a project at the time where it was not guaranteed that I was going to get out at 5. There were some nights where I was at work until 9, 10…. 12. I couldn’t risk missing the workout so the best way for me to do that was to workout in the morning. I was not perfect. Sometimes with work or because my body needed rest, I didn’t get in 100% of my workouts. That’s okay. Hit at the very minimum 80% of your plan. It is okay and you can still run your goals with that 20% flexibility. If you start to miss more than 20% of your workouts, according to my orthopedic doctor “think long and hard about what you’re about to do. You don’t want to risk damage to your body”. Another part of running or exercise that I don’t believe is talked about enough is internally having conversations with yourself. Check in with your energy before every workout. As much as it is vital to get your workouts in so you can hit your 5K, 10K, 13.1, or 26.2 goal, you also want to honor your body. Resting helps prevent injury and if you’re pushing too hard, it’s okay to skip a workout. Sometimes a day off is going to give you the energy to hit all of your other workouts for the week. Remember 80/20 minimum. I felt better about missing a cross-training day because I could combine weight training of a certain area of the body with another day. My runs felts important to get in so I tried my best not to flex on those. If I needed to move things around or forgo a workout somewhere in the week, I’d tried to get it in something else. People talk a lot about what to do prior to long runs, but not what to do after them. I kept walking immediately after I finished running especially if I've achieved a new distance and especially if I did not want to keep moving. You need to allow your heart rate to come back down safely. So I walked back to my car, grabbed my water and kept walking while re-hydrating. When I got home — in addition to making a smoothie right away — I put my legs up the wall for 20-30 minutes. This helps to return fresh blood to the legs (when you stand back up) and helps the lymphatic system drain. More of post-marathon/race recovery here. Did you mostly train outside or on the treadmill or a mix? I once was told that “if you can run on a treadmill with no music/podcasts/distractions for multiple miles, then you can run a marathon”. I completely agree. I prefer to train outside. Being outdoors emotionally makes me feel better, and running through nature or through a city helped take away some of the mental thought for me that often creeps in during running. I could distract myself from how exhausted I was or how I would rather be doing something else with the view of the trees or with the kids playing in the park. In this way, running helped connect me with my city. And I love that and THAT is what brings me back to running every time. Now, running outside isn’t always accessible especially if you live in a climate susceptible to storms of any kind. I recommend training in all weather conditions if you can because I trained in Austin, TX where it is >70 degree and sunny the majority of the year and my marathon was in 30 degree temperates with 30-40mph winds and pouring rain. Needless to say, the weather of my race wasn’t exactly the weather I had trained in. My race day was an extreme, an outlier that Boston has not seen for Marathon Monday in nearly 45 years; but the moral to the story: you never know what race day is going to be like. Run in the rain. Run in the snow. Run in the cold. Run in the heat. 2) If I can only get in a workout while is it excessively dark outside (early early morning). In 2018, it is still not always safe for women to run outside alone. You still hear cases of violence against women often in the media and I’ve personally been harassed on runs before; so if I feel as if I’m putting myself in danger or if I feel there is a risk I could be, I take it indoors to the treadmill. Like I said, I prefer to train outdoors… but sometimes, I don’t always have the luxury. I had to do 12 miles on a treadmill once due to an ice storm and after then, I realized that piece of advice was the most true statement I’ve ever heard. What do you think/know contributed to your training injury? How to prevent? *A kind reminder that this section is not to be used as a substitute for medical advice, diagnosis or treatment of any health condition or problem. Any questions regarding your own health should be addressed to your own physician or other healthcare provider. I felt so strong, so capable throughout my entire half marathon training. No pain other than some sore muscles after achieving a new distance, but really what I was feeling was sensation (not pain). Pain is sharp, shooting and when you know you have a problem. For me, pain came when I started attempting the 14-15 mile mark of training. That was when my body was saying “Jackie, I’ve had enough of this and I’d like you to revisit what you’re doing”. I started to experience this nagging, rubbing pain and tightness on the outside of my left knee when I ran and if I kept running on it, it would get louder and more painful. After a trip to the orthopedic doctor’s office, I was diagnosed with a severe case of IT Band Syndrome. 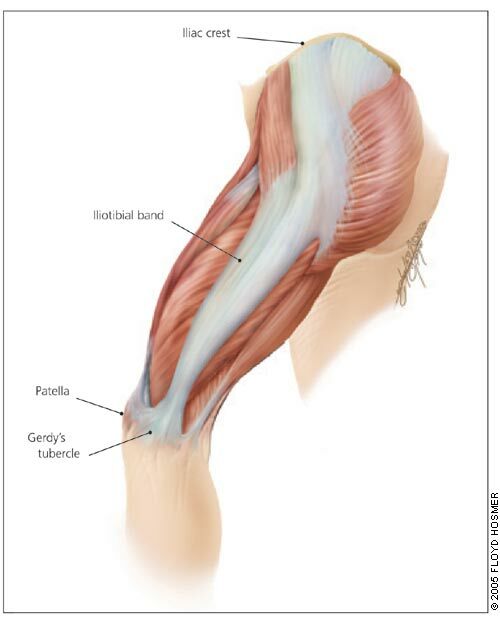 The iliotibial band is a thick band of fascia that is formed proximally by the confluence of fascia from hip flexors, extensors, and abductors. IT Band Syndrome can result from any activity that causes the leg to turn inward repeatedly. This can include wearing worn-out shoes, running downhill or on banked surfaces, running too many track workouts in the same direction, or simply running too many miles. "But how?” I thought. I was foam rolling 1-2x a week. I stretched before and after all exercise. What I was doing was enough for my old exercise routine… but it was not enough for marathon training. My glute muscles weren’t strong enough (also “how?” because I thought I was weight training a lot) to hold me past the 14+ mile mark so instead of my glutes doing the work, my IT band did. That’s not its function when running so it got really tight with overuse and it started to pull on the ligaments in my knee causing maltracking in my kneecap (hence the knee pain). I was a classic overuse case with not ENOUGH rest time and not ENOUGH strengthening, so my injury became a biomechanical issue. This wouldn’t have been such a problem if I stopped exercising at the rate I was. I could have let it heal then. My issue — I still needed to climb in milage and time off wasn’t exactly an option. Thank god (the universe or whoever) for my orthopedic doctor. He was one of the more understanding and kind professionals I’ve come across in medicine. As an ex-runner himself, he understood my desire to hit this goal so he worked with me and he referred me to a phenomenal physical therapist. My physical therapist worked with me to strengthen my hamstrings and glutes through hip abduction in addition to stretching the fascia of the IT Band. I increased foam rolling to 1-2x per day and I also started to do myofascial release work. I HIGHLY recommend spending every penny on this e-book if you are unfamiliar with this practice. This helped me to correct the common muscular imbalances caused by sitting and the repetitive motion of running. As I mentioned, my last long run before the marathon did not go well as planned. What I first thought was a foot cramp turned into being unable to bear weight on my foot for 4 days. 2 weeks out of the Boston Marathon with $7,000+ raised for House of Possibilities and I’m on crutches. This was such a dark and low point in my training and an expensive one. An XRay was not enough to determine a stress fracture so I needed to get an MRI. After much panicking and questioning the reality of this race, the doctors discovered that I didn’t have any stress fractures. BLESS. What was likely going on was dehydration and compressed nerves from overuse. So be kind to your feet (see sneaker section) and drink water always and replace your electrolytes after running. Your nerves need it. I trained in a pair of Asics and a pair of New Balances… I don’t necessarily have an opinion of what the best running shoe is, BUT I recommend with every ounce of my being that if you are serious about running and if you are committing to a long distance race that you go to a speciality running store and chat with someone about your running style, your gait, and your goals. Have them size you for the appropriate shoes for YOU. I realize that spending money on good running shoes is an incredible privilege — it hurts me that long distance running is for the privileged. With that being said, it is cheaper emotionally and physically to pay for well built running shoes, then it is for medical bills (extreme case example if you happen to get injured). Sneakers are arguably as important as strength training. Your feet are the foundation of the body. Your feet are what hit the pavement first and that impact travels up the leg with each step into the bones, the joints, the muscular system. Your feet walk you through the world and if you don’t take care of them with supportive footwear both in running and in life (sandals/flats/heels at work), your body is going to feel the impact gradually overtime. Most running shoes feel comfortable when you're standing in a shoe store, but the true test comes several miles into your run. The ideal shoe has more to do with your running style and the shape of your foot than anything else (cough cough.. not the logo on the side). In general, a pair of running shoes should last between 400 to 500 miles of running (3 or 4 months for routine runners). Take a look at your shoes and check if the midsoles and outsoles are compressed or worn. If they are, it is time for a new pair. In addition to good running shoes, take a look at to what you’re wearing the rest of the time you’re not running. Footwear that has minimal or zero structural support or protection put stress on the feet. And you’re putting stress on the feet through running. If you’re running shorter distances, it may not be a problem. And for some people running longer distances, you may be blessed and it may never be a problem for you. But for many it is a problem; so if you can, treat your feet well. How do you get in the race mindset? I think this also addresses "How do you get in the right mindset to prepare yourself for a long run?". I had a ritual before every long run. I would wake up at least two hours early, sometimes three, before I wanted to run. I would eat the bowl of overnight oats I prepared the night before and I would sit on my couch in silence. That sounds strange, but I put my phone down and really sat in the quiet. I didn’t distract myself with tv. I would watch the sun rise. I would slowly eat my breakfast. And I would mentally check in on how I was feeling. I never allowed myself to feel rushed. AND I did this before every long run whether it was 8 miles or 26.2. Getting into a habit or a routine that feels good to YOU trains your body to a rhythm. So come race day your body will already know what to do. As training went along, I really needed to talk myself up for the longer runs. Saturdays were long run days so sometimes starting on Monday I would mentally tell myself “you’re running 16 miles on Saturday. You can do this”. I would repeat it over and over again so I would believe it. I would tell my coworkers so I could verbalize the thought out-loud. I would get on my Instagram stories to share with my followers and this fueled accountability — “I told other people about this so I have to do it now”. I had to talk myself up to myself frequently, especially as the runs got longer. You need to mentally get on board with something and when you do, majority of the time, your body will follow through. Any runner out there will agree with me that running is equally a mental sport. Your race day was brutal (weather wise). Any tips if that happens to me? If the weather is less than idea for race day, it is a bummer but a-okay. I ran Boston in pouring rain, 30 degrees (which warmed to 40 when I finished), and 30-40 mph winds. When I write that down… I think “how the heck did I do that?”. The mental body is my strongest muscle, I suppose. Running while raining — Beware of running of the yellow and white paint on the streets. Those get slippery when wet. And take corners slower than you would normally. Run in the middle of the street versus the edges especially in the downhill areas. You normally are told to run on the edges because there are fewer people there (so you can pass people and pick up speed); but when it is raining, the water will collect on the sides and you could risk slipping and falling. I also wore a trash bag because it was REALLY raining. This helped to keep my body heat in and helped to keep me dry. Running in cold temperatures — Wear layers. I wore a sports bra, an Underarmor-like long sleeve, a zip up jacket, a vest, leggings, gloves, a hat and a trash bag. The vest and the trash bag kept my body temperature warm, and still prevented me from overheating. You still sweat in those colder temperatures even if you don’t feel it. It benefits you to keep the heat inward. My mom sent me off with hand warmers that I wore on the tops of my hands inside my gloves so I could still move my fingers around (a trick I learned from skiing growing up). Running in wind — My trash bag kept me warm, but it acted like a kite. I’m not sure I have the best advice on this since I felt as if I was running 26.2 pushing against myself. Try to run behind someone. The person in front of you will take the wind… not you. If that person isn’t there, keep going even if it’s whipping at you. You can do it! My parents met me a the half way point with an extra change of gloves and a dry jacket. Despite the trash bag, I still got soaked and my hands were numb. I don’t know if I would have been able to make it without that quick change of the most external layers because the weather was so raw and the risk of hypothermia was so high. If the weather is that bad, ask a friend nicely to meet you. If you don’t have a friend, take advantage of the medical tents if you have to. There is no shame in that. Did you eat a specific way? Yes, and it is of vital importance that before I talk about my experience with food while training that I talk about bioindividuality. 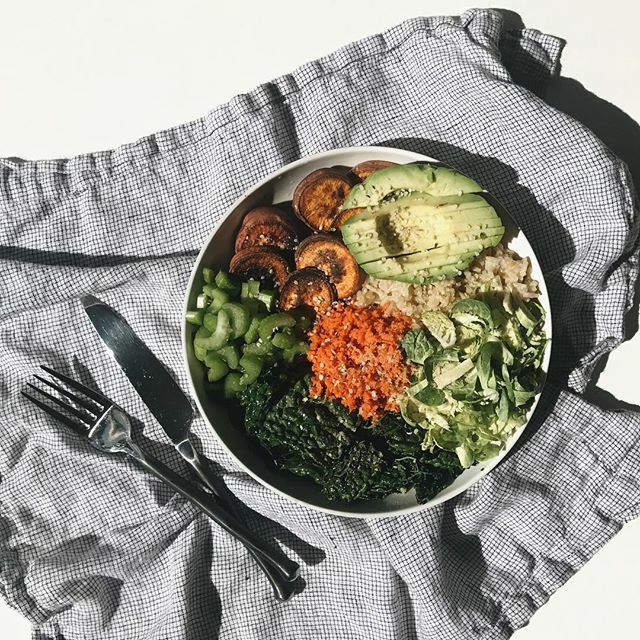 Coined by the Institute for Integrative Nutrition, bio-individuality is the idea that each of us has unique food and lifestyle needs. It is the understanding that no food philosophy or diet can yield the same results for everyone. There are many factors that contribute to your well-being, including age, gender, ancestral background, lifestyle, and your unique needs and personal preferences. I have two preferences that dictate my food decisions: I prefer to eat vegan when I can for environmental, ethical and political reasons and I prefer to eat real, whole foods and not eat processed foods loaded with hormone-disrupting chemicals. And if it every came to closing between the two (which is rare), I would choose lack of chemicals/other junk over lack of animal products. I prefer to eat things that don’t have a barcode on them or that don’t come in a box (majority of the time) — fruits, vegetables, grains, beans, lentils. My diet is mostly unprocessed, free of chemical additives and rich in nutrients when I eat real foods. My body fuels me to do so many amazing things: be a runner, a yogi, a daughter, a caretaker, an advocate.. the list goes on. And I want to prioritize fueling that vessel that moves me through earth to be the best it could be. My general rule of thumb: If I can’t read or understand the ingredient on a label, I usually don’t buy it. During training, especially the days leading up to long runs, I would participate in carbo-loading and fat-loading (meaning I would eat larger portions of carbohydrates and healthy fats). I will talk more about that below. How did you get over "hitting the wall”? In general, “hitting the wall” refers the feeling when you’re running longer distances and you feel like you cannot go any farther. You metaphorically hit a wall and you can’t imagine putting one more mile on your legs. More scientifically speaking, it refers to depleting your stored glycogen and the feelings of fatigue and negativity that typically accompany it. Glycogen is carbohydrate that is stored in our muscles and liver for energy. It is the easiest and most readily available fuel source to burn when exercising, so the body prefers it. When you run low on glycogen, your brain wants to shut down activity as a preservation method, which leads to the negative thinking that comes along with hitting the wall. You burn a blend of stored carbohydrate and fat for fuel all of the time. However, the ratio of these two fuels changes with the intensity of the activity. For example, during a speed workout you will use a higher percentage of glycogen in your fuel blend. On a long slow run, you would burn a higher percentage of fat and a lower percentage of carbohydrate. From the little that I know, the ratio is also dependent on your individual body. During the first 45 minutes or so of exercise (unless you’ve been on a ketogenic diet), your body is using glycogen to fuel you. After 45 minutes of exercise, your body will dip into fat burning. This seemed to be true for me… around 50-60 minutes of running, I felt the wall if I didn’t fuel properly. And because of this, I thought I could never get over the hump of mile 8-9. Then I started to regularly eat carbohydrates and healthy fats and I would load up on them 3-4 days prior to long runs. Note: The higher my mileage climbed, the more food I required on a daily basis. I was hungry ALL the time. My coworkers were shocked as to how much food I could eat and how often. Do not be alarmed if you start eating A LOT. How do I figure out what works for my body when it comes to food? This feels like a much longer conversation and it is a topic that deserves a longer conversation. For length of this article sake, I’ll say this: pay attention to how you feel physically, emotionally, and mentally when you eat certain foods. Check in each time or keep a journal if you want to track information. Do you feel happy? Are you craving it? Are you eating “xyz” because you feel like you have to or you should? Are you enjoying it? Do you feel bloated, lethargic, or uncomfortable after you eat? Do you feel energetic, full, and alert? Every physical body is so different, so it is dangerous that we label certain foods as “bad” or “good”, because what works or doesn’t work may be different for each of us. Whatever makes you feel your best, go for that. There is some science to it, and then also there isn’t. Do you! What are you favorite vegan post-run snacks/meals? If I’m going for a 1-4 mile run, I’m unlikely to eat anything prior. I typically exercise in the morning shortly after I wake up and I’m not that hungry then so I don’t eat before my workout. If I am hungry immediately upon waking, I’ll grab a energy ball from the freezer that I made (those usually consist of ground nuts, nut butter, coconut oil). Here is one of my favorite energy bite recipes. If not a bite, I’ll grab half of a banana or a handful of nuts. If I didn’t get my run in before work and I exercise after work, I am running on my body’s fuel from lunch or afternoon snacks. My long runs however, I ALWAYS eat beforehand. I will prep a bowl of oats with fruit and nuts the night before and eat that upon waking… roughly an hour or so before I ideally want to run. After running (regardless of short or long distance), I will come back and immediately make a smoothie with protein powder, fruit, frozen vegetables (like zucchini or sweet potato), greens (such as kale), coconut oil, and almond milk. 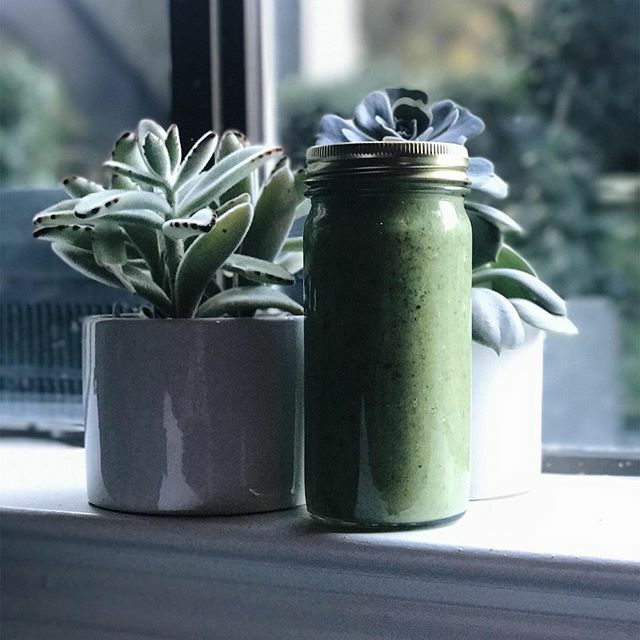 I liked smoothies post-run because smoothies are easier on the digestive system and for me, it’s a way to more easily and quickly absorb nutrients. I’m depleted and HUNGRY so I want to refuel as quick as I can. It is important to drink lots of water after exercise. Sweat loss occurs at about 3-6 cups/hour (depending on temperature and exertion). So in addition to my smoothie, I have a glass of water that I keep refilling. For activity lasting 60 minutes or more (such a long distance runs), cardio is an electrolyte-sensitive activity so it is important to replenish your electrolytes lost through heavy sweating. Electrolytes are commonly known to be in sports drinks like Vitamin Water or Gatorade. They are also in foods such as bananas, yogurt, milk, coconut water, oranges, watermelon, spinach. I made this recipe for my mom recently and I wish I had this recipe while training so intensely. Note: Remember this worked for MY body. It may or may not work for you. Give yourself the permission to experiment. Did you ever have cheat days? This is a personal point-of-view, but I don't like to call anything a "cheat" day. Food is meant to be enjoyed and putting rules and regulations on food feels to me as if you're taking the fun or pleasure out of it. I enjoy eating foods that are considered to be healthy. Every now and again I indulge myself in something that isn't, but I never feel as if I'm cheating and never do I feel guilty about it because I'm enjoying that “unhealthy” thing. I am content knowing that what is deemed less than “healthy” is not going to throw off my health or my training. So if you're asking if I eat 100% what society labels “clean” or “healthy” all the time, then the answer is no I don't and yes, I guess I have cheat days. However, I don't like to call it that. Are there vitamins/supplements you recommend eating during training? This is dipping a little a territory that could be dangerous. Don’t get me wrong... I supplement and I love supplements that are ethically sourced and made with minimal processing or junk ingredients. With that being said, I am a believer that all nutrients are best to come from real food, from diet. Anything else is extra. Supplementing for the sake of supplementing or because you don’t get it through diet isn’t optimal health in my opinion. You should work with a health care professional to discuss supplements based on the needs of your body, your blood work, your hormonal composition. They will know far better what is best for YOU than I will. I took an l-gutamine that I purchased from Whole Foods and would take 1-2 pills after a run. Amount depended on length and severity of the exercise. Why did I take it? Glutamine is an amino acid. Amino acids are molecules that play many roles in the body (1). Their main purpose is to serve as building blocks for proteins. L-glutamine can be produced naturally in your body. In fact, it is the most abundant amino acid in the blood and other body fluids (2, 3). I am a big fan of turmeric on all my roasted vegetables, in soups. Turmeric and the active curcuminoids from the plant have been studied for many years for their effect on joint health. Research suggests that turmeric curcumin helps maintain healthy joints by reducing inflammation in the body (4, 5). I had inflammation in my body as a result of injuries and in addition to physical therapy and rest, I put turmeric on my food daily to help with the swelling. 2) I was exercising so intensely that I wanted to make sure that I was getting everything I needed in the concentrations I needed. Though I ate large portions of real, whole food, my vitamin made me feel extra calm in the event I happened to not eat a specific food group one day for whatever reason. It was insurance that I didn’t have to think about food and nutrients every single second of every single day, that I was still getting what I needed. I take a vitamin called Ritual and I trust them wholeheartedly (after hours of researching on vitamins). If interested, here is a $5 off coupon. During both when I am training and when I am not, I take herb supplements called adaptogens. If you are unfamiliar with what these are, I talk about them on my instagram stories here. Adaptogens are herb supplements that have been used in Ayurvedic and Chinese medicine systems for thousands of years. They have been gaining in popularity in western culture in the last few years. An adaptogen called Cordyceps is thought to improve athletic performance by increasing the body’s production of the molecule adenosine triphosphate (ATP), which is essential for delivering energy to the muscles. This may improve the way your body uses oxygen, especially during exercise (6, 7). Many think adaptogens are voodoo magic. I am all about trying natural supplements from nature in small doses. 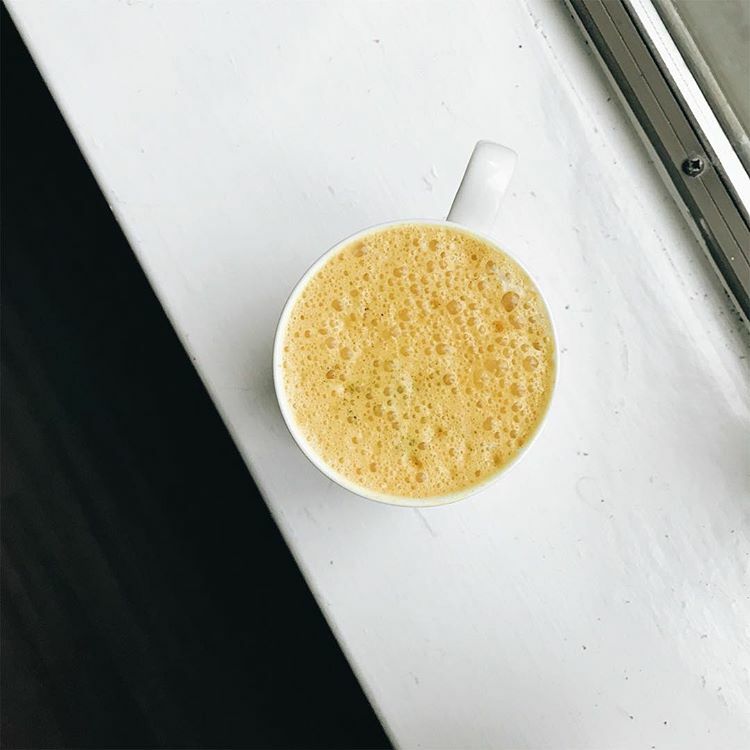 Be mindful — because adaptogens are potent, you should look into that specific adaptogens’ interaction if you are taking any medication. Lastly, I was sent pre- and post-workout supplements by Revere when training. I did not use them a good deal throughout my training because I didn’t receive that many of them and I didn’t buy more due to time left in training. However, I enjoyed the supplements that I took. I enjoyed the ingredients in them and they were good additions to my post-run smoothie. It’s a company worth checking out if you’re interested and you don’t want to overthink supplements. Did you eat those energy chew things during your race? Which ones did you eat? Yes. My body was in need of fuel big time, all the time. I have a higher metabolism, so when I “hit the wall” metaphorically in my training; that’s when I knew I needed to start taking gel with me on my runs. Remember how earlier in the article I said “if it every came down to choosing between not eating vegan or not eating chemicals, I would choose not eating chemicals?”. This is the one time in my vegan life when I’ve needed to pick between the two. All the gels I could find from running or endurance companies were loaded with junk. Because I was still recovering from post-birth control syndrome (yes… a MAJORLY real thing), I didn’t want to put chemicals in my system that would throw off my hormones. Running long distances already is disruptive to the female endocrine system so I wanted to be as gentle as I could given the circumstances. I found a supplement designed for athletes called Phat Fudge. I could read all the ingredients and know exactly what they were which is huge for me. I was supporting a woman-run business by purchasing this supplement and I was fueling my body with real food. I loved this gel. It was worth every penny to me, but I do realize this is an example of being privileged enough to make the choice to fuel my body with the “better" stuff. Note: Since I ran my marathon, they came out with their vegan flavor so my vegan athletes, you wouldn’t have to choose. How often should I take a gel when running long distances? That is highly dependent on your physical body. If I were to go for an 8 mile run, I wouldn’t bring one with me. But a 10 mile, I would. Those extra two miles for we were just enough where I needed a pack. For a 15 mile run, I’d bring two with me. For my marathon, I took 4 — one a the 5-mile, 10, 15 and 20 marks. This will take experimentation of whether or not YOU need it. And how did you go about drinking water during training? Did you plant waters around your trail or have a water bottle belt or something? Such a good question… It is amazing you are thinking about hydrating yourself during exercise. It is so important since you are sweating (regardless of temperature outside) and will be in need of replenishing. I was REALLY lucky that Austin has this beautiful walking/running trail around Town Lake/Lady Bird Lake. It was a perfect 10-mile loop with water fountains all round the trail. Majority of the time, I never brought water with me knowing that I could stop at a water fountain. The water I brought with me would stay in my car until I was done running. I did end up getting a small water bottle that clipped to a belt/fanny pack. I had that with me for my 14-miler and carried it the whole time because that run I didn’t stay on the trail. Some runs I didn’t feel like I needed water. My runs longer than 10 miles I did. I prefer to have it and not use it than need it and not have it. Did you do anything else for recovery? Yes. In addition to not exercising at least once a week, going to physical therapy, and doing myofascial release work, I scheduled a massage a few times throughout my training (three total throughout the course of 12 months — one after my first half, one between my 18 and 20 miler and one after the marathon). If you’re in Austin, go see Katie Davis at Hiatus Spa on W5th. She has a physical therapy background and as a runner herself, she understood the body and my pain so well. I trusted her wholeheartedly with my injuries. I also am a huge fan of cupping and acupuncture. I do NOT think any of this is NECESSARY to do in order to run a marathon and certainly not a half marathon. I would never suggest it a MUST to anyone because it is an extra financial cost and I was fortunate to work for a company where I could save money every month and still afford this on the side (because I made it a priority over other things). I do however mention these practices because I believe in holistic approaches to healing and I wanted to treat my body well since I was asking a lot out of it. What did you do about blisters and chaffing? I personally did not have to deal with this until my first half marathon. I had blisters badly on the bottom of my toes and chaffing under my armpits. I ended up buying running socks after that race to allow my feet to ventilate when sweating. Blisters may form when the skin has been irritated by friction or rubbing, heat, cold, and sweat. The socks helped. I occasionally got blisters after that, but your feet will start to get used to the mileage you’re putting on them and they will blister less. For chaffing, I would put a little body oil under my armpits before running and that seems to do the trick. By some miracle, I did not have one blister or chaff after Boston… maybe it was the weather. What is something you wish you knew beforehand/something you think people should know? Cut your toe nails before every long run. You’ll thank yourself. This type of training changed the composition of my body — my legs gained a good deal of muscle and I couldn’t find a pair of jeans in my closet that fit me for a really long time. On the other hand, I also started loosing muscle in my upper body because I wasn’t focusing on/strengthening as much upper body as I was before. Be prepared for your body to change and know that is okay. Speaking of your body changing, marathon running has an intense effect on the menstrual cycle. Many professional female runners experience the absence of menstruation, medically referred to as amenorrhea. Sounds nice to skip a period, but your period is considered to be a female’s 5th vital sign. It is a huge indicator to our overall health. If I were to train again, I would be excessively more thoughtful on how to train with my menstrual cycle. I have A LOT more primary and secondary research to do on this, but in my gut I know there is something here. For example when you exercise against the cycle, you put stress on the heart and what is the number one killer of women? Heart disease. There is not a ton of evidence connecting the two yet… but you know when you feel something in your gut to be right? That’s this for me. Here is some starter information on how to exercise with your menstrual cycle. I mentioned this briefly above, but I believe long distance running is for the privileged right now. You are paying for sneakers (not once… multiple times because you’ll wear your pairs out), for running clothes, for goos/gels. You are dedicating a large amount of time to the sport not only to run, but to recover as well. Monetary and time are resources that add up and it is a privilege to be able to afford that. Many are not as lucky. God forbid you get injured — money really adds up with doctors visits, XRays, PT visits, MRIs, KT tape. I am thankful for health insurance and even that is a privilege. As much as running 26.2 miles was really hard, I consider myself to be so freaking fortunate for having been in a position to even get to that finish line, to even attempt to get there. I would love to see this community begin conversations on how to make running more accessible for everyone, and I mean everyone who wants to be a part of this. I hope this was helpful to y’all who made it this far. Feel free to leave more questions and experienced runners, let us know what you do to make you the most successful runner you can be.